<!DOCTYPE html PUBLIC "-//W3C//DTD XHTML 1.0 Transitional//EN" "http://www.w3.org/TR/xhtml1/DTD/xhtml1-transitional.dtd"> Apple App-Sun Yat-sen Univ. 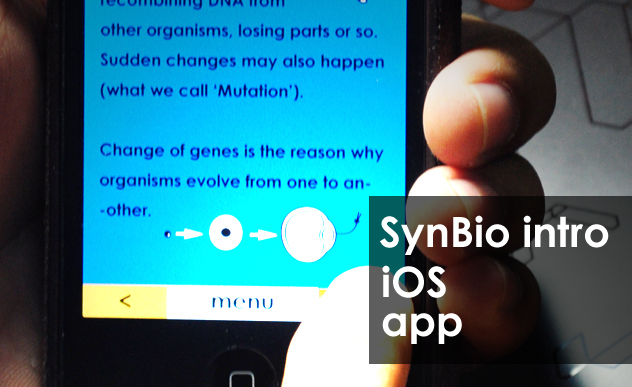 SynBio Intro is an app runs on iPhone / iPod Touch. It was designed to provide an all-in-one experience of modern biotechnology from explaining "what is DNA" to building an organism on your own. With easy language and friendly UI, you will geta joyful but deep impression on how synthetic biology works and change our lives. "The illustrations are fancinating and the introductions are easy to understand. The puzzle is really a challenge so that I have to read the content carefully, think it over, fully understand it and then get the answer. I really learned a lot from the friendly app." "The app is pretty good. You'll know that as soon as you download it." "Pretty lovely! SynBio is not as difficult as I think!"